ATM :: What should you do if your fund gets a new name and strategy? HDFC Prudence Fund (HPF), the country’s largest equity-oriented mutual fund scheme with assets close to Rs37,000 crore, will now be known as HDFC Balanced Advantage Fund and can switch entirely between equities and debt. Until now, it could invest only 40-75% in equities. On 25 April, HDFC Asset Management Co. Ltd announced plans for many of its schemes, as part of the ongoing merger and re-categorisation exercise. Most other fund houses, too, have announced their plans to re-categorise their schemes. If you don’t agree with your schemes’ new form, you have a chance to exit without paying an exit load. Here’s how you should decide what to do. If there is no change to your scheme, you have nothing to worry about. But if your scheme is about to change, check how big or small it is. For instance, if you own a large-cap fund that is set to become a large- and mid-cap fund or a multi-cap fund, it won’t matter much. In fact, this particular move is good, said Prateek Pant, head of product & solutions at Sanctum Wealth Management. “Going ahead, it will get difficult for large-cap funds to outperform their benchmark indices. The definition of large-cap fund has narrowed down and benchmarking performances against total returns index would make things tougher for large-cap funds,” he said. Read more here. If your scheme undergoes a big change, evaluate. For instance, SBI Treasury Advantage Fund, which will be known as SBI Banking and PSU Fund, was meant for short-term investments. Now, its strategy would be to invest in debt scrips of state-owned companies and banks. “If the risk profile of a scheme changes, look at it again. If it no longer meets your purpose, leave it,” said Vidya Bala, head-mutual fund research, Fundsindia.com. Don’t blindly go by the change in your fund category. Mirae Asset Emerging Bluechip Fund (MEBF)—an erstwhile mid-cap fund—has become a large- and mid-cap fund. The name remains the same, and, what’s more, the fund remains the same too. On the face of it, a shift from a mid-cap to a large- and mid-cap fund is a big change. But dig a little deeper and you might not want to worry about it. According to capital markets regulator Securities and Exchange Board of India (Sebi), a large- and mid-cap fund must invest a minimum of 35% each in large- and mid-cap stocks. As it turns out, MEBF has been increasing its exposure to large-cap companies over time; from an average of 20% in 2014 and 26% in 2015 to 38% so far this year, as per Value Research. “We didn’t want to tamper our existing portfolios too much. So, whichever categories our funds fitted into naturally, we have moved our funds there,” said Swarup Mohanty, chief executive officer, Mirae Asset Global Investments (India) Pvt. Ltd. HPF, too, remains the same. Although a dynamic category fund can switch entirely between equity and debt, a person close to HPF said it can—and will—continue to invest 65-70% in equities like always. Of course, how the fund performs in falling markets in the face of its present equity allocation remains to be seen as the fund will now be compared to other dynamic funds. HPF refused to comment. If your scheme merges with another or ceases to exist, there are no tax implications. If, however, you choose to withdraw, you may have to pay short-term capital gains tax of 15% (plus surcharge and cess) if you had bought the units in the past one year or long-term capital gains tax, otherwise. The only respite is you don’t pay an exit load, if any, even if you withdraw within the exit load period. Each merger and re-categorisation poses a unique situation. How one investor reacts to a change could be different from another investor’s reaction. Sit with your financial adviser to understand the ramifications of your scheme changes. But here are some broad principles you should follow. * If your scheme’s risk profile increases a little, there is no cause for alarm. For instance, a large-cap fund becoming a large- and mid-cap fund is acceptable. If your scheme’s risk profile increases a lot, take a closer look. For instance, SBI Magnum Equity Fund (a large-cap fund) is now a thematic fund SBI Magnum Equity ESG (Environment, Social, and Governance). * Just because the fund has changed its category or name does not necessarily mean the scheme has changed. Check if the scheme will continue with its strategy. * But if the scheme’s objective has changed—especially due to a merger with some other scheme—evaluate it. HDFC Gilt (government securities) Fund – short-term plan will now be merged with HDFC Corporate Bond Fund. Both schemes are different. * New investors, beware. Past performance is set to become a bit hazier, especially for those schemes that have to alter their strategies, for the next three years. In this case, check who the fund manager is, and go by his track record. * Debt funds are trickiest to navigate in this exercise. The good news is that they’ve become sharper and each of them now comes with a well-defined objective. Revamp your entire debt schemes portfolio. Balanced Funds have an overall equity spread of almost 65% either in the large, mid or small cap stocks. Balance funds are the funds which have exposure to two main asset classes – equity and debt. This fund gives you exposure to stocks as well as money market instrument. These funds have the equity orientation as around 65% of your monies get invested in equity and remaining 35% in debt funds. The risk associated towards equity exposure is almost of the same amount as the risk is associated with any normal equity fund do have. 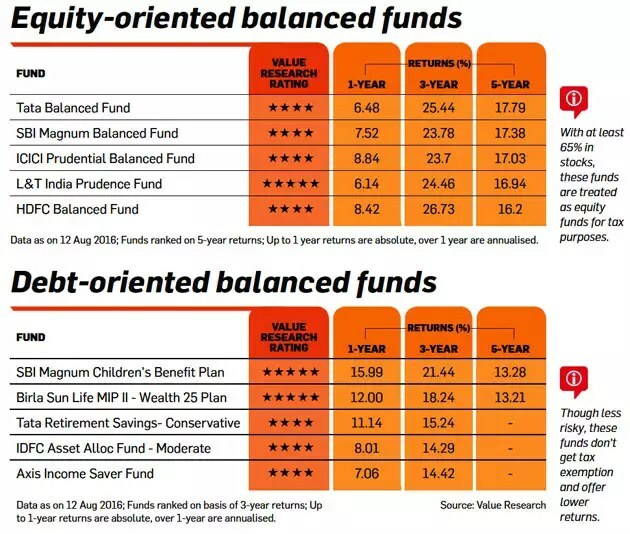 So, are these balanced mutual funds really ‘balanced’ enough? SEBI has recently proposed to change the name of the balanced fund into three categories – Aggressive Hybrid Fund, Balanced Hybrid Fund and Conservative Hybrid Fund. What does the equity spread consist of? Balanced funds have an overall equity spread of almost 65% either in the large, mid or small cap which can be extended even towards micro-cap funds. Having flexibility towards too many categorisations, the fund manager gets the liberty to choose stocks, however, that may welcome more risk to your portfolio. Therefore, check the holdings before investing in these balanced funds as the range between mid-caps to micro-cap can be risky if you are a conservative investor. What are new balanced funds? The Aggressive Hybrid Fund: It will invest in equities & equity related instruments between 65% and 80% of total assets and debt instruments between 20% and 35% of total assets. The Balanced Hybrid Fund: It will invest in equities & equity related instruments between 40% and 60% of total assets and debt instruments between 40% and 60% of total assets. However, no arbitrage would be permitted in the scheme. The Conservative Hybrid Fund: It will invest in equities and its related instrument between 10% to 25% of overall assets and debt instruments between 75% and 90% of total assets. Other hybrid funds which investors can further look to make investments can be – Arbitrage fund, Dynamic asset allocation fund and Multi-asset allocation funds. To provide more clarity to investors, these new categories of balanced funds termed as new types of hybrid funds will help investors to understand their funds in a much better way. Not only this, fund managers will also get clarity to structure their fund as per new rules, getting clear direction as to which stocks to select while designing the scheme. Hopefully, in future, there may be no room for confusion while selecting balanced funds for investing and switching between high risky to a less risky portfolio. Currently, all the balanced funds today are having an average exposure of 65% to equities, they come under the ambit of equity oriented fund. However, in future the new conservative hybrid funds can get debt tax treatment as more of the exposure is tuned towards debt asset class. LTCG: There is no long-term capital gain tax on equity funds after one year if gains do not exceed Rs 1 lakh. However, if capital gains exceed Rs 1 Lakh, the realised amount will get taxed at 10%. STCG: Short-term gains are taxed at 15%. Where gains are realised within one year. STCG: When realised within 3 years, these are taxed at marginal tax rate where a maximum taxation of 30% can be applied to short-term capital gain tax for both Resident Individuals & HUF. If you want better returns on your investments with relatively less risk compared to directly investing your money in the stock markets, then mutual funds may be a good option for you. Despite being subject to market risks, mutual funds are fast emerging as one of the preferred investment options in India. If you want better returns on your investments with relatively less risk compared to directly investing your money in the stock markets, then mutual funds may be a good option for you. Some of the funds, if carefully chosen, even have the potential to double your wealth over the long term. “This is, however, important to note that every single type of mutual fund category has a different ideal time horizon. And hence, when does your wealth double is a function of the same,” says Vikash Agarwal, CFA, Director and Co-founder, CAGRfunds. Large Cap Equity Funds – Invest primarily in large cap stocks. 1. SBI Bluechip Fund: With an AUM (Asset Under Management) of approximately Rs 14,000 crore, this has been a flagship fund of SBI Mutual Fund. “This fund currently has over 75% exposure to large cap stocks with the flexibility to invest up to 20% in mid-cap stocks. While this fund was known for a patchy performance till 2011, it has beaten its benchmark by a substantial margin in the last 5 years,” says Agarwal. 2. Mirae Asset India Opportunities Fund: Launched in April 2008, this is a relatively smaller-sized fund with an AUM of around Rs 3,800 crore. With around 80% exposure to large cap stocks, this fund has given a 17% returns since launch and is known as one of the most consistent funds within the category. 1. Kotak Select Focus Fund: Despite late entry into the category, Kotak Select Focus has consistently beaten its benchmark with a considerable margin ever since launch. This has resulted in a fast- paced growth and now it has an AUM of approximately Rs 11,000 crore. 2. Motilal Oswal Most Focused Multicap 35 Fund: The fund comes from a late entrant in the asset management industry, but as a management team they specialise in equity research. “With their strategy of taking concentrated bets with a long-term horizon, the fund has beaten its benchmark and category in the last 5 years. They have an AUM of around Rs 6700 crore and the fund is being managed by Gautam Sinha Roy,” informs Agarwal. 1. ICICI Prudential Balanced Fund: One of the oldest in its category, this fund has grown to an AUM size of approximately Rs 12,600 crore. With a diversified exposure across various sectors, this fund has consistently beaten its benchmark. 2. SBI Magnum Balanced Fund: With a patchy performance till 2011, the fund has made a strong comeback since 2012. “The fund manager follows a carefully crafted strategy of maintaining a balance between equity and debt exposure. This has helped the fund stay ahead of its peers over the last 5 years,” says Agarwal. 1. Sundaram Mid Cap Fund: Launched in 2002, this fund is one of the best funds when looked at from a long-term perspective. The fund has outperformed the benchmark across market cycles. The fund manager S Krishna Kumar is an industry veteran and specialises in picking quality mid cap names. 2. Mirae Asset Emerging Bluechip Fund: Though this fund has a shorter track record (launched in 2010), it has been a consistent outperformer within the category ever since launch. The focus of the fund is to select quality stocks which are relatively larger in size. 1. Franklin India Smaller Companies Fund: Launched in 2006, this fund has grown to an AUM size of approximately Rs 5,600 crore. “The fund manager is selective about buying growth stocks at reasonable valuations with considerable focus on quality of management,” says Agarwal. 2. DSP BlackRock Micro Cap Fund: One of the favourites in the category, this fund has showcased phenomenal performance since launch. Temporarily suspended for any further inflows, the fund currently has an AUM of approximately Rs 5,800 crore. Investors saving for goals that are 4-6 years away are advised to go for balanced funds. These funds invest in a mix of equities and debt, giving the investor the best of both worlds. The fund gains from a healthy dose of equities but the debt portion fortifies it against any downturn. They are suitable for a medium-term horizon. Mumbai-based Koyel Ghosh has been investing in a balanced scheme for the past two years for funding her entrepreneurial dream. She will need the money in about 2-3 years from now. She has been investing in an equity-oriented balanced fund for the past two years. She should redirect future SIPs in a debt-oriented scheme to reduce the risk. Balanced funds are of two types. Equity-oriented have a larger portion of their corpus (at least 65%) invested in stocks and qualify for the same tax treatment as equity funds. This means any gains are tax-free if the investment is held for more than one year. These schemes are more volatile due to the higher allocation to stocks. On the other hand, debt-oriented balanced funds are less volatile and suit those with a lower risk appetite. However, the price of this relative safety is that they offer lower returns and the gains are not eligible for tax exemption. If the investment is held for less than three years, the gains will be added to your income and taxed at the normal rate. The tax is lower if the holding period exceeds three years. The gains are then taxed at 20% after indexation benefit, which can significantly reduce the tax. Balanced funds have done very well in recent months because both the equity and debt markets have rallied in tandem. But this performance might not sustain, so investors should tone down their expectations. Also, investors might note that the one-year returns of debt-oriented balanced funds are more than those from equity-oriented schemes. But this changes when we look at the medium- and long-term returns. The five-year returns of the top five equity-oriented balanced funds are significantly higher than those of debt-oriented balanced schemes. This statistic should be kept in mind if the investor plans to remain invested for 4-6 years. Balanced funds have attracted huge inflows in recent months, but some of this is for the wrong reasons. Some fund houses are pushing balanced schemes that offer a monthly dividend. This might sound attractive because dividends are tax-free, but in reality this is your money coming back to you. Unlike the dividend of a stock, the NAV of the fund reduces to the extent of the dividend paid out. Even so, several fund houses are using this gimmick to attract investors. In some cases, fund houses have even told distributors to alert clients about future dividend announcements and reel them in. This is also an unhealthy practice aimed at garnering AUM by mutual funds. Equity-oriented balanced funds are a good choice to beat the current volatility in the markets. These funds invest up to 35 per cent of their corpus in debt instruments and thus provide good downside protection for risk-averse investors. Franklin India Balanced is a fund that fits the bill in this category. In falling and yo-yoing markets, Franklin Balanced remains resilient. In 2011, when the bellwethers and broader markets lost 25-27 per cent, the fund lost only 13 per cent. In the see-sawing markets of 2015, the fund emerged on top, gaining about 5 per cent, while the indices fell 1-5 per cent. Franklin Balanced managed to stay on top in the 2014 rally too, by deft asset allocation. The fund did not latch on too much to riskier mid- and small-cap stocks to ride the bull run and allocated less than 15 per cent of its equity portfolio to the same. It, instead, took advantage of the rally in bond prices, by increasing its holdings in government securities in this period. A sharp up-move in both equity and bond markets saw the fund clock 47 per cent return in 2014, as against the 30-37 per cent clocked by the bellwethers and the BSE/Nifty 500 indices. Its returns are better than of peers’ such as Canara Robeco Balance and Reliance Regular Savings Balanced. The performance even matches that of diversified equity funds such as SBI Magnum Equity. The fund normally keeps its mid-cap allocations to less than 10 per cent of its equity portfolio, barring occasional spikes up to 15 per cent during market upswings. Its top sectors are typically a combination of cyclicals and defensives. The fund has stepped up its holdings in bank stocks after a breather last year due to multiple headwinds hitting the sector. Barring SBI, its choices lean towards private banks such as HDFC, IndusInd, YES Bank, ICICI and Kotak Mahindra Bank currently. In the auto sector too, the fund pushed up stake in Mahindra and Mahindra, betting on good monsoon. Other holdings here include Hero MotoCorp, Tata Motors and TVS Motors. Power Grid Corporation, Maruti Suzuki, Mahanagar Gas and Oil India are recent entrants. About 26 per cent is allocated to government securities. In the last couple of months, the fund has been trimming its exposure to corporate bonds. While its exposure to corporate bonds is not significant currently, in the past it has stuck with higher rated bonds — those rated AAA or AA. Timing the market or deciding how much to allocate to debt or equity at any point of time is a difficult decision for most investors to make. Investors not willing to invest in a basket of products, could choose balanced funds which automatically rebalances your portfolio . 1. What are balanced funds? Balanced funds, as the name suggests, are hybrid funds which typically invest in equities and debt instruments. There could be equity oriented as well as debt oriented hybrid plans. Typically, equity-oriented balanced funds have a 65%-75% exposure to equities with the balanced 25-35% being invested in debt-oriented instruments. Many financial planners suggest firsttime investors into mutual funds begin their journey by investing in balanced funds. 2. What is the advantage of investing in a balanced fund? Balanced funds offer benefits of asset allocation model in a single structure. The equity component seeks to deliver long-term returns, while the debt component provides stability to the portfolio. This diversification limits the portfolio from downside risks if either equity or debt enters a bearish phase. When the markets are high, the fund manager has to compulsory sell equity to maintain the maximum level and likewise when the markets are low, the fund manager has to buy equities to maintain the minimum level of equity investment. This is a regular process which a retail investor can’t do because of lack of knowledge and expertise. 3. What taxation benefits do equity oriented balanced fund investors enjoy? Since balanced funds have an average exposure of 65% to equities, they are taxed as equity funds. These funds enjoy tax-free returns if the holding period is greater than a year; otherwise, they are subject to short-term capital gains tax. Many investors opt for the dividend option in such schemes, as the dividends are tax-free (without any dividend distribution tax) in the hands of the investor. After the new tax laws where debt funds are taxed as short if held for less than 36 months, the balanced fund is one option where the entire debt holding is tax free if the fund is held for more than one year. If you invest in debt funds of mutual funds, you get advantage of long term capital gains taxation with indexation only after three years.